How much is the rate for New Accent and 2nd hand accent car? 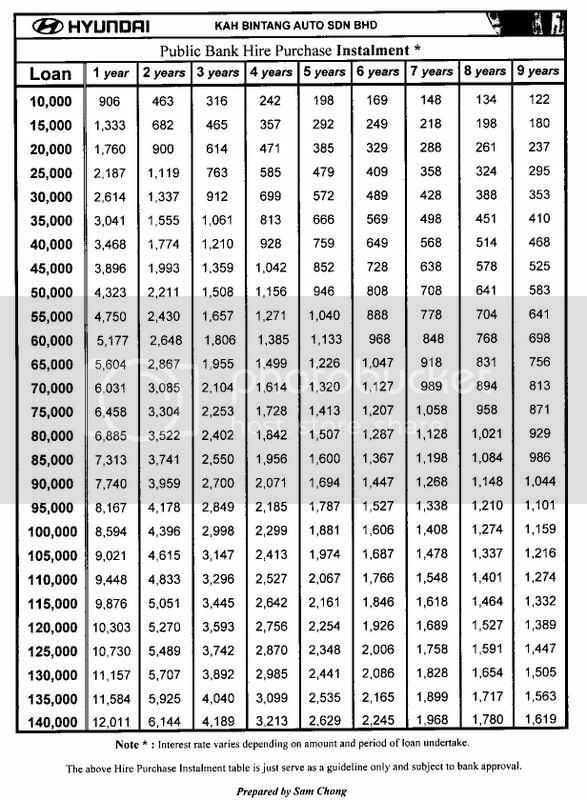 the interest rate varies from banks to banks, finance to finance... there is not fixed rate set by KB... sometimes KB will have promotion allied with banks/finance to promote their cars, not to mention for certain models only. 2nd hand cars is following the market interest rate and also depends on banks/finance. one advise from me is the 2nd value + interest rate for used Accent should not as good as own a new ones. maybe you contact your nearest or favorite bankers/finance to find out what is the offered interest rate? P/S: a small hint, the offered interest rate also depends on buyers' credit scoring. 2.9% consider good liao... i think you need to know more about car market. agreed with you. 2.9% considered very good rate already. if you saw in newspaper that Honda/Toyota giving low interest rate, guarantee have condition. What I understand is, the more you loan, the longer the period, the lower the interest rate. Honda now is offering 2.6% but only selected model. So you cant really compare it with accent. Is totally different. I have enquired the rate from one of the SA from KB Jln Ipoh during the roadshow at Metroprima. He quoted me the rate of 2.99% with Public bank (recommended coz lowest rate among others banks by the SA). But he told me that sometimes the bank will have a promotion period to further lower down the rate if their customer is less. But the latest rate is already good if we compare with the rate with local cars. Like some others car (toyota, honda, etc) which they already have a special agreement with the bank, they can give us a lower rate as 2.6% because they want to promote their not-popular demand models only. For what i understand, the optimum loan rate is 7 years but the rate will be slightly higher if the loan period is above 7 years. And the more money to be loan, the lower the rate is. If you got others loan (housing, etc.) with the same bank with a good paymaster records, you can negotiate with the bank officer for further better rates than the market rates. Good Evening Members, below are the latest interest rates from Public Bank for the non-national vehicle. Disclaimer: Interest rate are subject to change without prior notice. 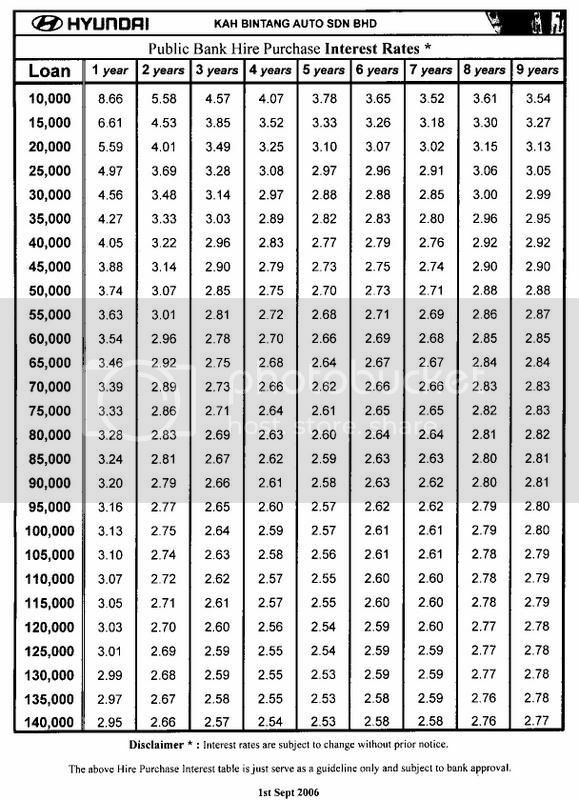 The below table is just serve as a guideline only and subject to bank approval. 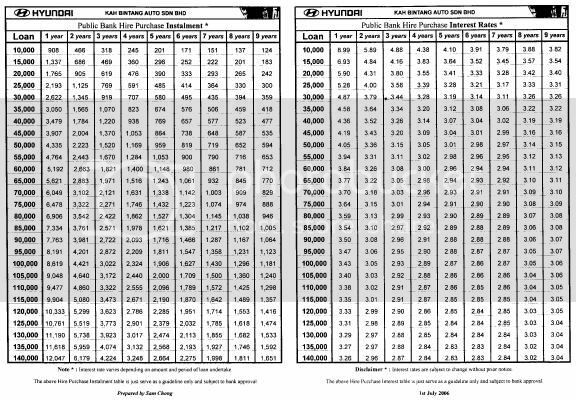 Good Morning Members, below are the latest interest rates from Public Bank for Hyundai CKD vehicles.